The following gas water heater and furnace chimney flue size calculations are based on Peoples Gas “Construction Guide for Gas Usage” in the city of Chicago and National Fuel Gas Code. Before applying any of the following rules, you must check your local building code requirements, and appliance manufacturer installation instruction. Have you checked your house brick chimney lately… or whatever type of the chimney you have? Did you have a new furnace or water heater installed / was your house chimney flue recalculated for those new appliances? The purpose of a plumbing vent in your house is to remove sewer gases from the drainage system and equalize its atmospheric pressure. Without the plumbing vent, our toilets and all other home plumbing fixtures might not be draining properly, can cause unusual noises (like gurgling or belching as and after they discharge), and could be responsible for an unpleasant sewer gas smell inside the house. A house plumbing vent is one of those features that may easily become compromised. 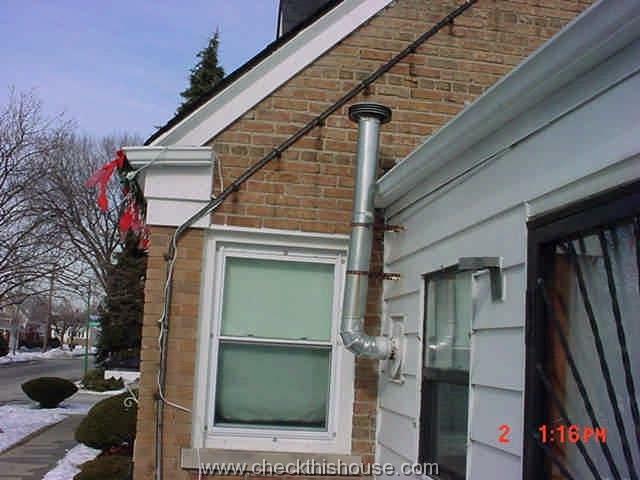 Proper furnace / water heater venting is an extremely important issue, which depends on the performance of the house chimney / chimney flue or other exhaust assemblies. The conditions explained in this post also apply to the wood burning appliances. Consequences of improperly assembled vent pipes, problematic chimney flue, deteriorating chimney walls can be sometimes fatal – fire and Carbon Monoxide poisoning are topping the list. Therefore, combustion products from your furnace, water heater, wood burning fireplace, and any other appliance that requires some kind of an exterior vent / chimney, have to be properly properly discharged to the exterior. Improper house gas water heater venting could be hazardous for you. Have a look at the pictures, and get it right, get it now – it’s easy and it can save your life. 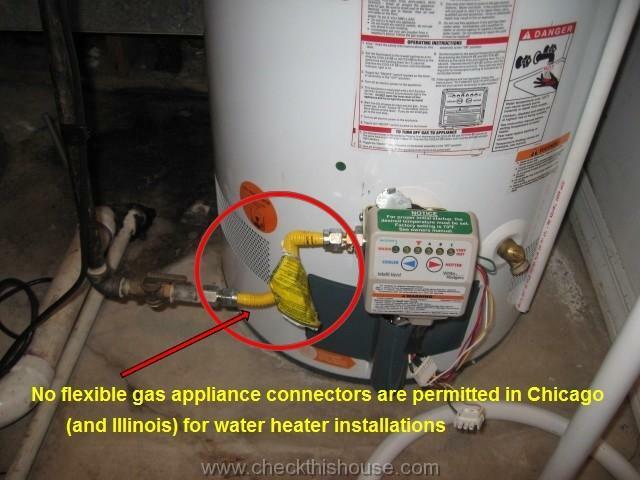 Illinois remained very conservative, as far as water heater gas connector type (or any other permanently installed appliance gas connection), which used to be black steel pipe only. However, according to Peoples Gas / Nicor website “Updated Construction Guide” (just fill-up the pup-up from and you’ll be able to open it) the use of CSST – corrugated stainless steel tubing, as a final gas connection for permanently installed appliances, such as water heaters, furnaces and boilers is now permitted. Water heater TPR valve must be installed on every water heater (gas or electric). Water heater TPR valve is also known as Watts Temperature and Pressure Relief Valve. The pressure relief valve is usually located on top or side wall of the tank enclosure (tankless water heater safety valve, also known as T&P valve is located underneath the appliance).